If you’re anything like me, you had a few questions when you first got into the art of soap making. 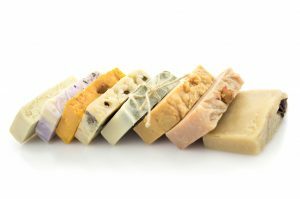 Top on your list was most likely, “what are cold and hot processes, and what’s the difference?” Today, we are going to explore hot process soap making and go through a simple step by step tutorial on how to make your very first batch. First, let’s talk a bit about the fundamental difference between hot process and cold process soapmaking. Hot process uses an external heat source to bring the soap to gel phase, where it is then molded. This is contrary to cold process, which uses internally generated heat to do this. Design-wise, hot process has what many call a “rustic” or less refined look, with little to no opportunity for swirling or intricate designs. However, many soapmakers love HP because of it’s quick turnaround; many soaps can be used the following day (although a longer cure time is recommended for a harder bar). There are a few essential things you’ll need in order to embark on your first hot processing journey. 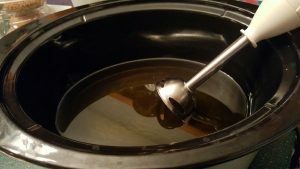 For this article, we will be covering hot process soap made in a crock pot. This article is going to focus primarily on the process itself with the assumption that you have found a recipe and are ready to use it. Measuring your ingredients and preparing your mold first will drastically streamline your hot process soapmaking experience. Measure your oils (both solid and liquid, but keep them separate for now), lye, water, fragrance and colorants; then, prepare your mold. Now that you’re all measured and prepared, set your crockpot on low and add your solid oils. Once added, they will take a bit to melt; while you’re waiting, move on to Step Three to mix your lye water. This can be the most intimidating step for new soapmakers; I was there too! When handled properly, lye is perfectly safe. With your apron, goggles and gloves firmly in place, mix your lye into your water; never, ever pour your water into your lye: this will cause a negative and dangerous reaction. Stir the water with your chosen wood or silicone spatula as you are sprinkling the lye in to keep it well mixed; stir slowly, being careful not to splash, until incorporated. Then, let your lye sit until it is clear and completely dissolved; this will also give it time to cool. You will notice that combining the lye and water will produce fumes; this is perfectly normal. Do your best not to breathe in these fumes. Once you have mixed your lye water, check on your oils. If they are melted and if you have chosen to use liquid oils too, you can add those at this point to heat. When your oils are heated to around 120-130 degrees, then you can add your lye water. Your oils should not be over 180 degrees when adding the lye water, or a negative reaction will occur. Make sure your oils are melted completely before continuing. Step Three: Time to Make the Soap! Alright! You’ve checked your oils and they are at a balmy 120-130ºF, and your lye water has cooled for about 15-20 minutes. Time to combine the two and make beautiful, beautiful soap! 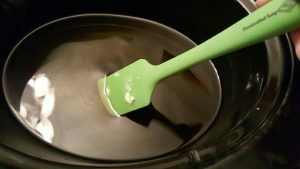 Lay your stick blender on the side of the crock pot and gently pour the lye water into the oils you have. Do this slowly; rushing may cause unnecessary and harmful splatter. By using the shaft of the stick blender as a means of diffusing the lye water, you will drastically reduce the risk of being splashed. Once you have poured in all of your lye, stir for a few moments with the bell of your stick blender to begin incorporating the lye water into your oils. 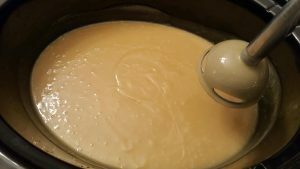 Then, pulse your stick blender on low and slowly circle around the pot, keeping the bell of the blender immersed in the batter; this will help to eliminate air bubbles. Periodically, hold your stick blender upright and while the bell is seated flat on the bottom of the crock pot, tap it up and down to get rid of unwanted bubbles. Lay your blender against the side of your crock pot; slowly pouring the lye water down the shaft will help to prevent splashing. Stir, stir, stir! You will be alternating between pulsing your stick blender and using it to stir for about 10-15 minutes to emulsify your mixture, and reach what is called trace. You’ll know you’ve reached trace when you pull your stick blender out of the batter between pulses, and ridges of liquid are visible on top of the mixture (see below). The trails in the soap indicate that trace has been reached. Once you have reached trace, it’s time to cook! Put the lid on your crock pot, and continue to the next step. Your soap is going to change form quite a bit through the cook process. You may notice that the edges start to bubble; this is normal! Once the bubbles rise, you can do one of two things; either you can stir it down gently (recommended if it starts to bubble a lot) or you can leave it to cook. Be sure to scrape the sides of your crock pot while the soap is still in the cook process; if you scrape down while it’s hot, you’ll cut down on the amount of dried soap on the sides before you mold. After awhile, your mix will start to look like Vaseline; it will have a glossy, almost iridescent appearance and will be wax-like to the touch. Depending on your recipe, this can take anywhere from a half hour to an hour. Once you’ve reached this consistency, it’s time for the next step! Now that your soap has cooked, turn off the heat in your crock pot. If you are adding fragrance, you’ll want to allow the batter to cool for a bit first; adding it at very high temperatures will cause some of the fragrance to dissipate, leaving you with a faintly scented product. Adding the fragrance under 180ºF will help to keep it in your soap instead of in the air around you. You can also add your colorants at this point. If this is your first time making hot process soap, I would recommend using one color and fragrance until you get use to how the soap behaves when it is cooling. You’ve scented, you’ve colored; now it’s time to mold! Grab your prepared mold and plop your soap batter in; you can use your spatula to smooth it out, but try to work quickly. If your batter cools down too much, it will be difficult to work with. Once you’ve filled your mold, pick it up and tap it a few times on your workspace to help work out any air bubbles. 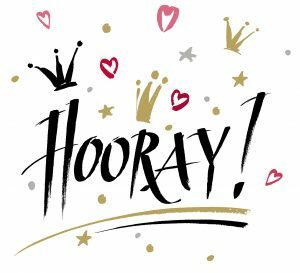 If you are using any decorations like lavender buds or glitter on the top, add it now! Decorations will be much easier to place and will stay on better if your soap is still nice and warm when they are added. Now, the waiting begins. Most hot process soap will be ready to slice after about 24 hours; as with any bar of soap, the longer it sits, the harder and better it will be. Letting it sit for at least a week will really make a difference in the overall quality of your bar. The hot process method of making soap produces a nearly ready-to-use bar, and is a relatively easy method for those just starting out. If your first batch isn’t quite the way you want it, don’t give up! You’ll find that after a few times, you’ll have your recipe down and the method mastered, too. We want to see your hot process soap- share your newly crafted hot process soap in the comments section of our Facebook post for this article so we can see your awesome work! I prefer making hot process soap. I love the process. I’m so happy you are writing about this technique. I’ve never tried making hot process soap before, but this article makes it seem less complicated and messy than I thought it would be. Thanks for the article, I’ll be trying this soon.